Chrichton's World: Review War a.k.a. Rogue Assassin (2007): One plot twist too many! Review War a.k.a. Rogue Assassin (2007): One plot twist too many! As a huge thriller fan I can't get enough of twists and turns in films that elevate the viewing experience. Sometimes I don't mind them being far fetched or over the top. However in War it's one that doesn't make sense and is so random that it comes out of the blue with very little build up to it. There is nothing in the plot that warrants such a twist since most of the story is your typical action fare with nothing remarkable about it. Besides we watch these kinds of movies for the action and not it's plot. No offence to Jet Li and Jason Statham. But they aren't actually what you call Shakespearean actors. Unfortunately the people involved in this film thought different. I honestly don't know what they were thinking. 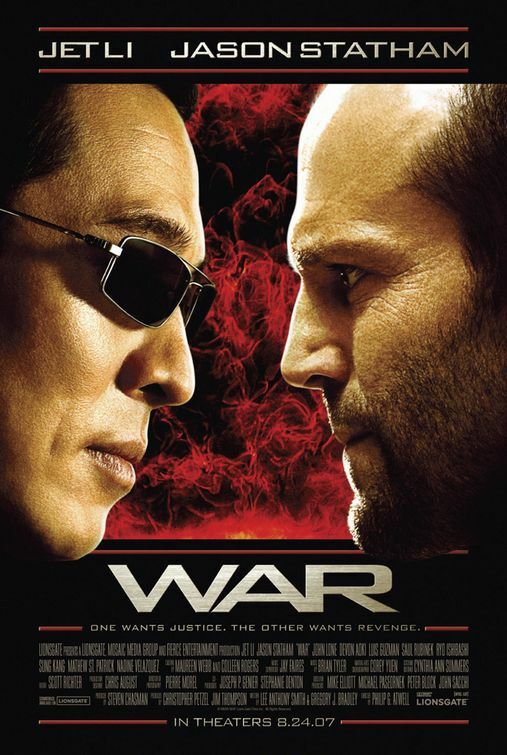 How hard can it be to put Jet Li against Jason Statham and let them beat each other to a pulp? But proper choreographed fights without quick cuts. It's what the fans wanted since The One. But no apparently that is too much too ask since director Philip G. Atwell felt the need to be clever. It has to be stated that Atwell mostly has directed Eminem music videos. I know that often video music directors are among the most creative so it could have worked. However it is clear that the leap was to steep. Especially since he did not even attempt to deliver good action. A good director needs to use the talent that is available. Jet Li is a martial arts legend. To use quick cuts on him is beyond stupid and insulting. There is not a single exciting action scene in this film. Of course not since all the focus went in the generic plot and that ridiculous twist that comes out of nowhere. Atwell hasn't done anything after War. If that isn't an indication then I don't know what is. I could go in detail and explain to you a little more how bad this film is. Instead let me save you the time and cut to the chase. War is beyond terrible. It's one giant waste of time that has no redeeming factor whatsoever. Without a doubt this is Jet Li's worst film he has ever been involved in.